In this blog post, Linda Waldman discusses a recent session at the World Health Summit on Gender Equality within the Global Health Workforce, exploring key themes which emerged, how far we’ve come, and what we can do to bring about change in this area. The World Health Summit took place in Berlin in October 2017, with one of the very first panels investigated Gender Equality within the Global Health Worforce. 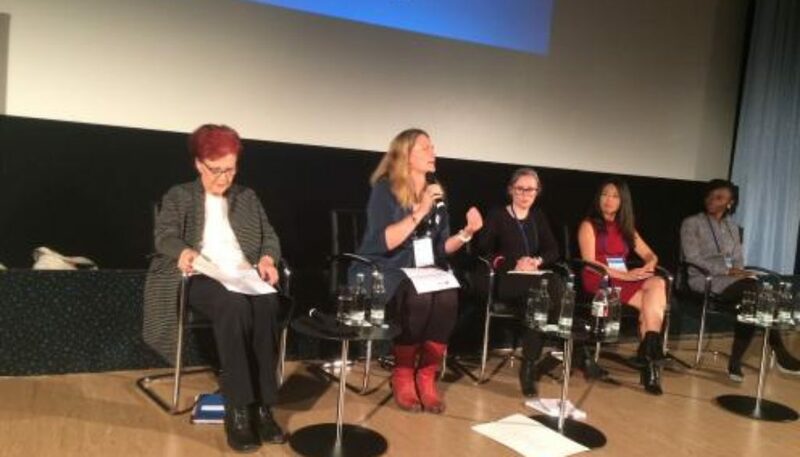 The organisers – Women in Global Health and Monash University, supported by RinGs – and chaired by Sally Theobald from RinGs – organised an impressive panel to debate the challenges, and how far we have come, in promoting women as leaders in health. Keynote speaker, Dr. Heidemarie Wieczorek-Zeul, former Federal Minister of Economic Cooperation and Development, Germany offered a policy perspective, arguing that it is important to strengthen women’s collective position and bring forward their ownership and support. Heidemarie pointed out that one woman alone can’t change things, rather women need to stand together and support each other to take up strategic leadership roles such as finance and health ministers. Only in this way will women be able to change policy priorities and bring about real change for women in Africa and elsewhere. Dr Tana Wuliji, from the World Health Organisation, reminded us that women learn that they are not leaders at a young age. She stressed how gender equality starts in the household when kids are small, with the words we use to talk to our children, for example whether we encourage them and say that they can be CEOs or presidents; and with the resources and opportunities that we offer these children. The importance of ‘decent work’ – which is productive, pays fairly, offers security, creates opportunities to progress, embraces the right to express concerns and which ensures fair treatment between men and women was discussed as an entry point into gender transformative change both within the health sector and beyond. Ms Olawumni Oduyebo, Founder of All Things Health Africa, offered a private sector perspective. Picking up on the theme introduced by Tana, Olawumni explained how she, as a young girl, could not imagine herself as a leader of a company as there were no women CEO role models to look up to. Olawumni spoke about the barriers and challenges she experienced as a young woman entering the world of business and of how she had to work longer, harder, and smarter, to constantly prove herself. She relied on inner strength – ‘my mindset was the solution’ – and refused to accept the conventional roles reserved for women. Today Olawumni is herself a role model for other women, showing them that solutions do not need to be limited by the constraints society places on women and girls and supporting them to achieve their visions. Professor Charlotte Rees, from Monash University, spoke about the medical and academic context. She discussed how this traditionally masculine work environment creates a sense of un-belonging for women who, despite registering in high numbers as students, are under-represented as leaders. Like Olawumni, Charlotte explained how she too needs to over-perform, and women academics have to ensure that they are research active (while enjoying less access to resources and fewer collaborations) alongside a tendency to undertake more teaching and administration. These teaching and administration roles are, however, not recognised for promotion. Heidemarie, Tana, Olawumni and Charlotte – Doctors, Professors and CEOs – are four amazing women working to promote women’s leadership in diverse areas of health, academia, policy, business and international organisations. Their testimonies showed the complex, yet common ways in which gender, power and patriarchy play out to limit gender equity in health and to constrain women’s leadership opportunities in health systems. Underlying all their presentations were two questions: how far have we come and what can we do to bring about further positive change? In 1992, when the UK delegate of the UN’s Advisory Committee on Science and Technology for Development raised the issue of working on gender in science, in preparation for the Fourth World Conference on women in Beijing, in 1995, the idea was met with considerable resistance. The delegates struck a bargain, support for another issue in order to get agreement to promote gender equality in science. The resulting report was reviewed by developing country policy makers – who claimed that there wasn’t nearly enough evidence in the report – and by academic feminists – who thought the report under-theorized. The UN Advisory Committee realised the need to build its case for evidence and to build the links between knowledge and action. This need to build links between knowledge and action continues to this day. Yet, there is no shortage of research and evidence of women’s exclusion from all areas of leadership. Popular books address the topic in business (Lean In) and in academia (Why so slow? ); and an endless succession of academic papers examine women’s performance in social and natural science, in business , and in global health. The term ‘glass ceiling’, refers to obstacles, often invisible, which prevent women’s ascent to positions of leadership and status. The ‘glass cliff’, introduced by Ryan and Haslam in 2005, refers to the fact that women executives are more likely than men to be put in leadership roles during periods of crisis, when the potential for failure is highest. A ‘chilly climate’, used by Dugan and colleagues, describes male-dominated environments in which both structural conditions and relationships marginalise and devalue women, creating psychological barriers about women’s ability and efficacy. Women have to navigate a ‘crystal labyrinth’ in which networks and relationships are critical to achieve scientific prowess and status, yet as McCullough argues, further disorientation stems from the lack of transparency around work relationships and with unequal access to mentors. ‘Sticky floors’ – a term used by Freehill and colleagues – refer to the difficulties women experience in progressing to senior leadership and ‘glass escalators’ delineate the lack of senior women in some professions, particularly health and nursing, despite large numbers of women working in these domains. Women’s routes to success are thus filled with dead ends, wrong turns and backtracking before being able to, ultimately, achieve success. These metaphors are evidence of the depth and breadth of research on women’s inequality in business, academia, policy, international organisations associated with health and act as a reminder of the power of gender stereotypes to shape women’s experiences of work and leadership and of the fact that, while some women are able to become high-profile leaders, the general environment in which they operate is hostile. What can we do to bring about change? How can women’s leadership and gender equality within the Global Health Workforce be promoted? Delegates shared ideas of how to bring about positive change through a series of case studies presented by Prof. Jan Coles, Ms Sonia Singh, Dr. Sharyn Tenn and Ms. Sreytouch Vong, respectively. They emphasised the importance of getting gender-based violence education embedded in medical curricula; and recognised the opportunities for change in the private sector, the value of new innovations – controlled by women – that protect women from HIV and strategies to promote gender equity in the workforce. Emerging from these case studies were several proposals for change, such as policy interventions, male support for women’s activities, specific gender champions, designated committees to ensure equal opportunities, and flexible training structures. A lot of discussion focused on the need to support individual women as well as addressing broader social, political and power dynamics that act as barriers, and for the need to take action at all levels – institutional, political and individual – to promote gender equity in the global health workforce. More importantly, the panel and discussion reminded me how actions, big and small, can contribute to better equity for women, of the need to link the wealth of evidence now available to action, and most importantly, of how we all – junior staff members, senior women, men, mothers, academics, boys, politicians, guardians, girls, colleagues, teachers, fathers, collaborators – have a role to play in bringing about positive change to promote gender equality in the global health workforce.